Protects liver, Improves Appetite, Effects easy and regular bowel movement, Reduces constipation, Effective in all Alcoholic Liver Diseases, Cures cronic dyspepsia, indigestion, acidity, flatulence, heartburn and anorexia. AMLAKI, HARITAKI, MUTHA, TEUDI, AJWAIN, KALMEGH, ROHITAKA, BHUI AMLA, SUNTHA GULANCHA, CARICA PAPAYA. For treatment of liver dysfunction use two (2) teaspoonful twice daily before meal. 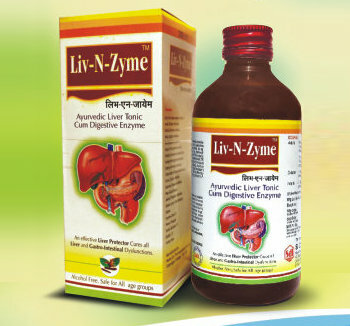 For treating constipation take Liv-N-Zyme four (4) teaspoonful with luke warm water in empty stomach in the morning and at bedtime. Or as directed by the physician.